(18/P048) TRENTON – The Department of Environmental Protection is joining the New Jersey Historic Sites Council and Preservation New Jersey in honoring projects that preserve the state’s history, Acting Commissioner Catherine R. McCabe announced today. The 2018 award honorees include restoration of a World War II battery, a 19th century lighthouse, a Victorian greenhouse, two downtown adaptive reuse projects, restoration of a Revolutionary War-era bridge, and a nomination of multiple maritime properties in a southern New Jersey community for listing on the National Register of Historic Places. Awards were presented Thursday during the 28th Annual Historic Preservation Awards at the Hamilton Club Building at Passaic County Community College. The awards recognize significant contributions to the advancement of historic preservation, restorations, rehabilitations, and adaptive use plans of historic buildings and cultural landscapes. They also spotlight innovative documentation of historic resources that contribute to knowledge of New Jersey’s past as well as pioneering efforts to preserve communities, buildings, archaeological sites and other types of historic resources. The 2018 Historic Preservation Awards are sponsored by the State Historic Preservation Office. A critical first line of defense of New York Harbor during World War II, the 1943 Battery Lewis is a 600-foot concrete and steel structure covered with earth that has been abandoned since 1974. It housed two 16-inch MkII M1 guns and support facilities. A restoration plan was developed in 2014 and has since been completed on the entire structure, except the guns, which became scrap metal years ago. This structure now provides an educational and improved visitor experience on the importance of how these batteries protected American ports during the war. Maurice River Historical Society, Inc. Standing at the mouth of the Maurice River and Delaware Bay since 1849, East Point Lighthouse operated until after World War II. Once decommissioned by the U.S. Coast Guard, however, deterioration set in. Since 2000, a combination of public funding sources has provided much-needed restoration work to address water damage, moisture levels, electrical and mechanical upgrades and accessibility. 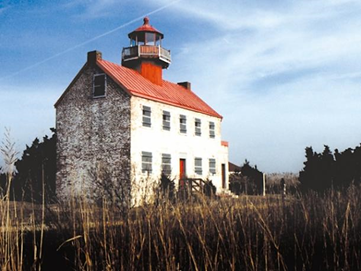 Today the lighthouse is open to the public as a historic site. Historic Morven, Inc. and Hunter Research Inc.
Mid-Atlantic garden history and the Victorian interest in horticulture came to life when the original circa 1854 greenhouse remains at Morven were unearthed during archaeological testing for another project. The result is an exhibit that includes an indoor reconstruction of a portion of the greenhouse, displays of archival records and materials, and public archaeology workshops for Morven visitors. This rehabilitation project successfully combined development, design and preservation to become a model for urban revitalization. The historic 1901 Hahne & Company Department Store in downtown Newark was once one of the nation’s largest department stores until it closed in 1986. Today it is a 400,000 square-foot building that houses residential, retail, commercial and cultural uses as well as a newly expanded Rutgers University campus. 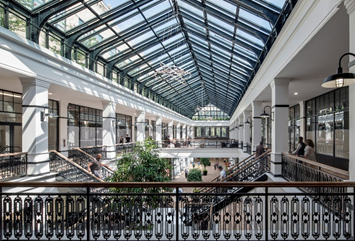 The ornately detailed masonry and limestone exterior was meticulously restored as was the original monumental skylight over the interior public arcade. A student idea sparked a five-year journey that culminated in March with the addition of Mauricetown – a village with a rich maritime history and striking Victorian architecture of sea captain and shipbuilder houses – to the National Register of Historic Places. A University of Delaware graduate student initiated the idea for listing on the prestigious register, filling out a nomination and compiling extensive historical documentation. The effort grew to involve a team of students and staff, a grant from the New Jersey Historical Commission and support from community members who provided housing for graduate students during field research and town meetings. Roebling Lofts is an adaptive reuse of the 1917 wire rope manufacturing building in the historic 6.8-acre Roebling Complex in Trenton. It includes 138 residential loft apartments, commercial space, restaurants and retail units arranged around a large open, public space. Begun in 2009, the rehabilitation work and adherence to the U.S. Secretary of the Interior’s standards has enhanced the new mixed-use design. The project in the Trenton industrial corridor is also seeking LEED Gold Certification. The Stony Brook Stone Arch Bridge in Princeton, built in 1792, is New Jersey’s oldest stone-arch bridge still in use. The ruins of Worth’s Mill Run, built in 1714, are next to the bridge, and the late 19th century Stony Brook Floodplain Bridge also is connected to the stone arch span. Collapse of a portion of the Stone Arch Bridge’s parapet in 2016 triggered a combined project to restore the Stone Arch Bridge and replace the Floodplain Bridge. 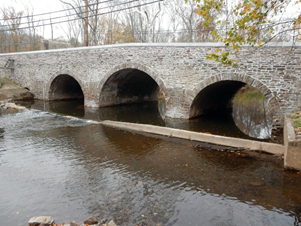 Adhering to the Secretary of the Interior’s Standards, the design and preservation project yielded historic and scientific research benefiting the understanding of 18th century stone bridge design and historic grist mill technology.